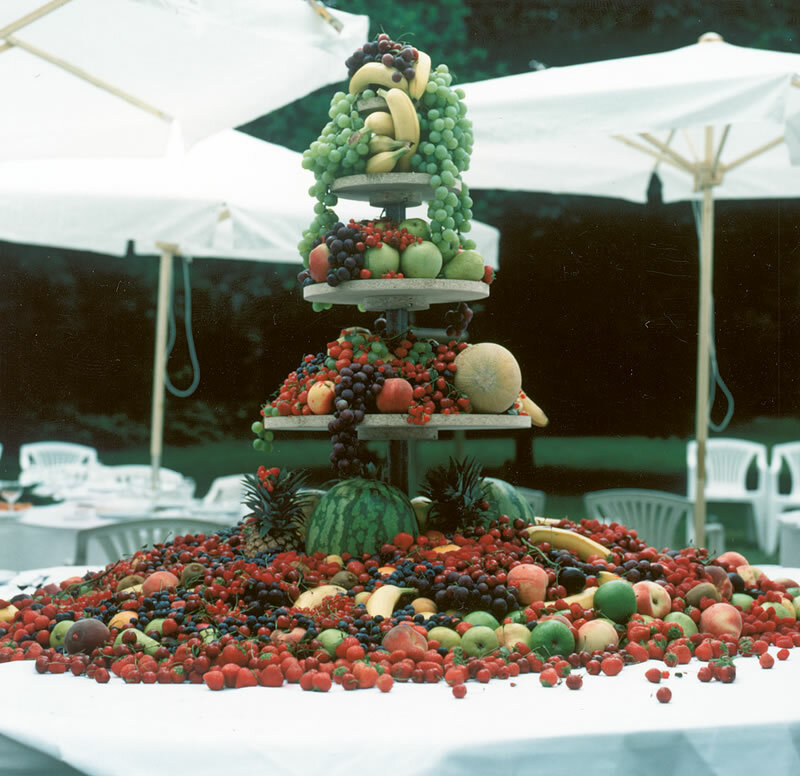 Crudité is a culinary and communicative event. Guests are offered a choice of raw material, e.g. vegetables, furits, mushrooms, berries, spices, dairy products, drinks, etc. for its further processing. Each guest becomes his or her own cook but may also cook for other guests. 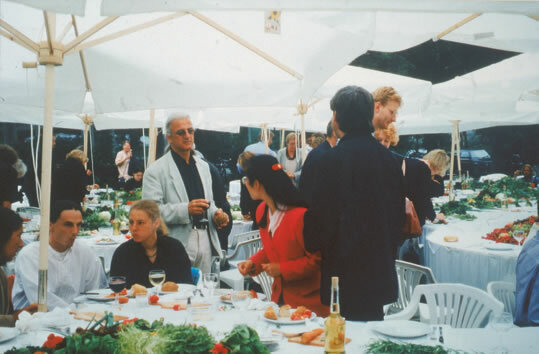 In an installed space (on a meadow), tables and chris are placed following aesthetic and communication criteria in such a way that each guest can immediately mix and relax while simultaneously making contact with other guests. A cutting board and a paring knife are located at every place. The guest is presented iwth the sensuous spectacle of the various, lovingly arranged, washed raw materials on the tables as well as additional materials that might be needed such as salt, pepper, herbs, etc. Soon he or she notices that participation in any culinary delights necessitates the use of his or her own hands. In the end, the guest partakes in a sensuous journey of discovery. 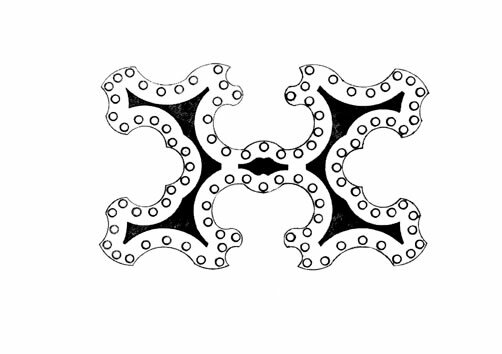 He or she must recognize, design, and combine materials and accessories. For example, the various kinds of vinegar and oil for a vinaigrette can only be accessed by their color and smell. Wine and other drinks can be refilled again and again at another spot by using little pitchers. The guests are active and in movment, located within a constant current. The dinner stretches over several courses, each de- manding a new design and the guest can change seats as often as wished to have conversations with other guests or to undertake group action. Discreet personnel (Performers: Regula Kopp, Markust Hensler and Verena Schwab) do not serve food in the normal sense but rather are responsible for the prompt removal of any organic refuse ensuing from a Crudité intervention. Additionally, personnel can, for example, aid a "clumsy," guest in the preparation of a dish or in the choice of oil. At the end of Crudité, performers slowly collect leftover raw material and pack it into little doggy bags. Guests are bid goodbye with these packages which they can take home with them as souvenirs. For more conventional guests there are various cheese platters and types of bread at hand. 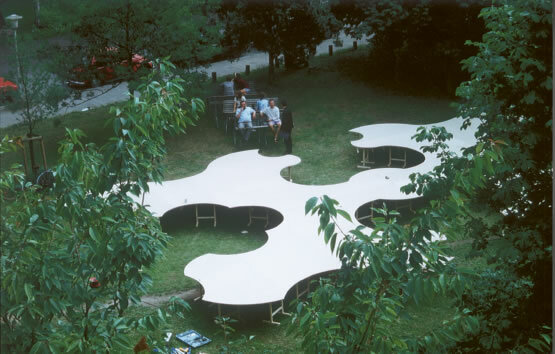 Bird's eye view of the "table," made of 24 panel elements and 60 sawhorses. The beginning of Crudité: detail of the first guests preparing their own food. Original sketch of the "table" by Joseph Gilliers: etching from "Cannemeliste français," Nancy, 1751. Plywood table, approx. 120 x 160 cm., 60 sawhorses, 160 chairs, 50 umbrellas, tablecloths, table settings, approx. 350 kilograms fruit and vegetables, various oils, cheese, bread, and drinks. In collaboration with 3 performance artists.